Enter the Tournament of Cuddles for big prizes including Credits, Trophies, Conquer Cup entry... and a Red Star The first Red Star ever to be issued! Valentine's Day Map - our special Map for the occasion is for Doubles Games Only. Snare a partner and get to canoodling! Speed Battle Royales will be running throughout the day, with highly juicy Heart drop rates. Visit the Conquer Club Matchmaker to find your CC Sweetheart! By answering a simple set of questions our Matchmaker will hook you up with some highly desirable Clubmates. Then you can score big Heart bonuses by going on a gameplay date with your chosen ones! Start any other game with a sweetheart - 1 Heart per Game. Please report all games here to the the Conquer Club Matchmaker. You can win up to 25 Hearts from the CC Matchmaker for games, and another 10 from the the Morning After Tournament. Win additional Hearts just by signing up for the Morning After Doubles Tournament with one of your CC Sweethearts from the Matchmaker game. Sign up on the 14th and you'll be wondering what on earth you were thinking when you wake up on the 15th, but it will all be worth it if you win that Red Star. Speed AutoTournaments will run throughout the day, spitting out Hearts for those are quick-witted enough to score on the playing field. All good romances start with chat. Well, most of them do. The others start with ice cream. Anyway - pop into Live Chat on Feb 14th and say something sweet (or just something, if sweetness is a stretch) and you may just score yourself some Heart love. The Dating Games are a scavenger hunt designed to find the most date-worthy players based on their skills at finding hidden items (hint: to find something that might be good for a date, it helps to know what types of things might be good for a date... or what a date is). Live Chat will having mini contests throughout the day giving clues to the locations of hidden items. If you can successfully find enough items to have a successful (or, at least, non-tragic) date, you win Hearts... the number depending on how good the set of items for your date is! Every hour, starting at midnight, at random intervals during the hour, Caption Contests will be held in Live Chat, with Hearts galore for the winners. 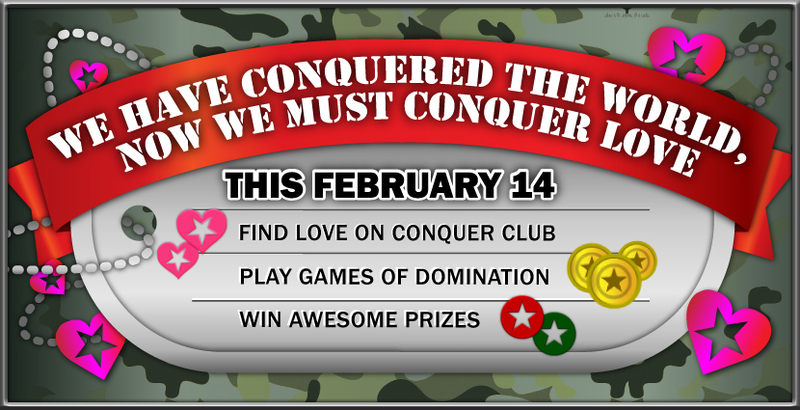 Share or post on Facebook or Twitter using #ConquerLove and including your Username to win up to 5 Hearts. Apparently Cupid has cut a deal with the Conquer Gods as they will be raining Hearts down upon us throughout the day. The grand finale of the event, this is a Scheduled AutoTournament with great prizes. To qualify you have to collect 69 Hearts throughout the day. The winner scores 1500 Credits, Conquer Cup Entry, a Red Star and a Tournament Trophy. Yep, for those that don't have the moves to make the big tournament, for a mere 10 hearts you can play (polymorphic games) with yourself on Singles Awareness Day (Feb 15th). Just take your leftover, broken, hearts to the Tournament Page to enter. So if I'm #69 on the leaderboard right now do I get some kind of special bonus? No "find the hearts" on maps images or something like that? I mean no real contest for GA ? Everything is CC time peeps which means EST. Correct Big? KingRat wrote: Everything is CC time peeps which means EST. Correct Big? Correct, the event runs in CCT, meaning it starts at midnight on Feb 14 CCT (which happens to be EST). Also the event goes for 24 hours... so wherever you are you will get a full day of this event. Crap, I'm busy most of the day that day (I hope). Well, it looks fun at least. 1. Do I understand that I not only have to collect 69 (you guys are bad) hearts, but I also need to be the first 32 people to do it, in order to get in the tourney? 2. If a game on the valentines map starts on the 14th, the chances it will finish on the 14th are slim to none for most of us. Are hearts only awarded on the 14th? 3. Do you receive hearts for wins on games that finish on the 14th but were started earlier than the 14th? 4. If you sign up for dubs games that don't fill up and start on the 14th, will you get any hearts? 5. When you refer to the "Valentines Day Map" is it different than the "Happy Valentines Day" map? 6. I see the "Happy Valentines Day" map is now available but when I select it, I don't see any map. Is it working now? 7. If you have played a Battle Royale in the last 30 days will you be ineligible from playing the Battle Royale speed games on the 14th? 8. I am a little confused about "The Morning After" tourney and how we are supposed to earn hearts for it, if we are limited to earning hearts on the 14th. KingRat, it is a good angle, isn't it? Around 180 degrees. Thanks for the questions, and hope the answers clarify things for people. In essence all activities will be running on Feb 14th (CCT) and Hearts can only be collected on that day. Specific answers below. stealth99 wrote: 1. Do I understand that I not only have to collect 69 (you guys are bad) hearts, but I also need to be the first 32 people to do it, in order to get in the tourney? stealth99 wrote: 2. If a game on the valentines map starts on the 14th, the chances it will finish on the 14th are slim to none for most of us. Are hearts only awarded on the 14th? stealth99 wrote: 3. Do you receive hearts for wins on games that finish on the 14th but were started earlier than the 14th? stealth99 wrote: 4. If you sign up for dubs games that don't fill up and start on the 14th, will you get any hearts? stealth99 wrote: 5. When you refer to the "Valentines Day Map" is it different than the "Happy Valentines Day" map? stealth99 wrote: 6. I see the "Happy Valentines Day" map is now available but when I select it, I don't see any map. Is it working now? stealth99 wrote: 7. If you have played a Battle Royale in the last 30 days will you be ineligible from playing the Battle Royale speed games on the 14th? No, these BRs will be special event BRs, outside the regular BR system. stealth99 wrote: 8. I am a little confused about "The Morning After" tourney and how we are supposed to earn hearts for it, if we are limited to earning hearts on the 14th. You earn Hearts by entering the tourney on the 14th. The tourney itself will have other prizes. are general achievement medals being handed out? thanks bigwham, that clears up everything. This looks exciting, I am looking forward to it. This is one beautyfull event, i love LOVE. i've arranged a romantic night out with the love of my life. Looks promising, can't wait for the BRs. What if you get into the top 8 and you've already entered into the Conquer Cup? Do you just get the credits as opposed to the entry? Can you make some kind of lottery, so that some will get all the hearts and love for participation, while others will instead be given punishments on the day, like mean messages and injustified deduction of points and stars etc? Last edited by wookie1 on Wed Feb 12, 2014 5:17 pm, edited 1 time in total. BW, how is the tourney 1v1 on happy valentines day map if the HVD map is only available for dubs?? NoSurvivors wrote: BW, how is the tourney 1v1 on happy valentines day map if the HVD map is only available for dubs?? It will only be available for doubles in regular play. In special tournaments or BRs it will be played with other game types. Does the post to facebook/twitter have to be on the 14th or can we do it prior? Man, this sounds like a great event! I'll mostly be busy on V-Day, though, being a smooth, romantic devil. Ah, such is life! How does one get a love heart? I want to join. ganguscalm wrote: How does one get a love heart? I want to join. It tells you all that on the first post buddy.